The CDs are marked with the DDD logo, however the analogue recordings have been digitally re-mastered. Mendelssohn, sometimes known as the �classical romantic�, was revered in his lifetime as one of the very great composers. He has become considerably less regarded since the mid-twentieth century, although in recent years the tide seems to be turning in his favour. Only a handful of compositions has kept Mendelssohn�s name in the spotlight. Masterworks such as, the Violin Concerto, the Overture to a Midsummer Nights Dream and the Octet for strings are the still the most likely to be encountered on record or in concert, and the Scottish and Italian symphonies and the Hebrides Overture (Fingal�s Cave) have also remained popular. Of the composer�s substantial choral output only the oratorio Elijah and to a lesser extent St. Paul are still performed by choral societies. Musicologist Edwin Evans has described how Mendelssohn was born into the romantic era, but his aristocratic fastidiousness made him averse to the romantic excesses of his time, even when writing for the orchestra. He was perfectly comfortable in the old world of classical form and refinement but infused with a new lyricism. For many years it became fashionable to disparage Mendelssohn on account of his gentle romanticism that to later generations appeared mere sentimentality. Subsequently, a reassessment has resulted from the reaction against later excesses. Gradually Mendelssohn became rehabilitated, not for his romanticism, but for his almost classical formal elegance. It is now recognised that whatever may have been Mendelssohn�s weaknesses, his sense of classical form was well-nigh perfect. He excelled in understatement and nuance, in subtle, colouristic orchestrations that lent his scores an undeniable freshness and vividness. Mendelssohn only on rare occasions attempts to achieve significant depth and drama in his "cultured, well mannered, refined, and exquisitely fashioned music �" (David Ewen) Musicologist Ewen explains how Mendelssohn did not aspire to the new kinds of romantic musical expression striven for by contemporaries such as Berlioz, Schumann and Liszt. He did not seek out new romantic forms, being thoroughly satisfied with the style and structures of the Viennese classical period. "He did not particularly try to make music a medium for the projection of extra-musical experiences, ideals or sensations." Biographer Daniel Gregory Mason says of Mendelssohn, "his style is too fluent, too insinuating and too inoffensive, to embody tragic emotion. It lacked rugged force, the virile energy, the occasional harshness and discordance� its reading of life in which there is ugliness, crudity and violence, as well as beauty, is too fastidiously expurgated." With particular regard to Mendelssohn�s chamber music, Musicologist R. Larry Todd in his essay on �The String Quartets of Mendelssohn� contained in the Emerson�s Deutsche Grammophon set writes, "Chamber music remained a constant preoccupation of Mendelssohn throughout the meteoric career that established him at the forefront of German music during the 1830s and 1840s. Already at the age of seven, the boy was coached in ensemble playing by the Parisian violinist Pierre Baillot, and among Mendelssohn�s earliest surviving works are various pieces for violin and piano from 1820, and a series of learned fugues for string quartet from 1821, all written under the supervision of his composition teacher, Carl Friedrich Zelter." Around 1825 Mendelssohn and his family moved into a grand mansion in the Leipzigerstrasse on the outskirts of Berlin. In the extensive grounds was a garden house which contained a room large enough to seat a sizeable audience at the family�s Sunday morning chamber concerts. It was at these gatherings that the young Mendelssohn gained much of his musical education, both as a listener and performer. As well as the piano he also played the violin and the viola and regularly took part in performances of the several String Symphonies he had already composed. From these early years, examples of Mendelssohn�s chamber scores include the String Quartet in E flat major composed in 1823, when he was fourteen, the three Piano Quartets, the Piano Sextet and the Octet for strings, Op.20 from 1825, his sixteenth year. Mendelssohn�s music in general is becoming far better served in the catalogues and his works for String Quartet can now boast many top-class versions. Complete sets of the Quartets have been around for some time; notably those from the Cherubini on EMI 585693-2; 585805-2 and 586104-2, the Melos on Deutsche Grammophon 415 883-2GCM3 from 1987, the Coull on Hyperion CDS44051/3 and the first complete set to be recorded by the Bartholdy in 1973 on Acanta 43 075. These works are all now firmly established in the repertoire. The market for Mendelssohn�s complete works for string quartet is now an extremely crowded and competitive arena, with several sets of the highest quality being newly released. The inescapable result of reviewing so many accomplished recordings exposes us to the danger of falling into the well-used bag of superlatives. In this �labour of love� the complete sets that I have included in this survey to review are from the Aurora on Naxos; the Talich on Calliope; the Henschel on Arte Nova; the Bartholdy re-released on Arts Music; the Emersons on Deutsche Grammophon (including the Octet for strings) and the Pacifica on Cedille. In addition, the Leipzig Quartet have recently concluded their complete series (plus the Octet) on the MDG label MDG 307 1055-2; MDG 307 1168-2; MDG 307 1056-2 and MDG 307 1057-2. I have only two of the four volumes and have therefore not included their set in this survey. At the time of writing this review I heard on the radio that The Eroica Quartet have just completed their set of the complete string quartet works on Harmonia Mundi. Mendelssohn wrote the String Quartet in E flat major in 1823 when he was fourteen. Although published posthumously in 1879 and never allocated an opus number, it has been severely neglected over the years, despite its special charm and invention. In the work, together with the Op.13 and Op.12 String Quartets, we find a youthful composer appearing, confronting and partially transcending the classical traditions of his predecessors Haydn and Mozart. I would not disagree with descriptions of the quartet as being a �student exercise� with the treatment of instrumentation restricted and tentative. Particularly striking is the prominent part for the first violin, a practice that he would never completely remove from his string quartets. Also of note is the sequence of the movements and their tempos. With regard to form, in all but one of his other string quartets (Op. 13), Mendelssohn placed the slow movement third. In this String Quartet in E flat major he places the slow movement as the second movement, as Haydn and Mozart usually did. The work is conservative, competently written with few shifts in modulations or tonic transitions. The sonata form of the opening movement allegro moderato is very regular in its layout with two conventionally patterned themes through exposition, development and recapitulation. On Naxos, the Aurora give an elegant performance of delicate string writing of Viennese charm. The commanding forces of the Bartholdy are stately and sophisticated with Viennese charm in abundance. They seem to have all the time in the world and play with a confident swagger. Unfortunately there is a slight glitch in the sound at point 7:37. The Pacifica wonderfully convey the young composer�s tentative string writing with the prominent part for the first violin. There is briskness, much sparkle and vitality in the spirit of Haydn and Mozart from the Talich compared to the Emersons who are weightier and forthright rather than lightweight and delicate. The Henschel in their interpretation offer ardent playing with a sense of a real enthusiasm and enjoyment. The second movement adagio non troppo is much more lyrical and chromatic and the influence of Haydn and Mozart is strongly felt. The Auroras offer appropriate charm and finesse in their reading and the Bartholdy are abundantly refined and extremely expressive. There is auspicious playing from the Pacifica that has a high degree of sophistication. The Talich are tasteful and unlaboured without affectation while the Emerson are rich and expressive. There is little sense of charm in the edgy interpretation from the Henschel who uncover a sense of foreboding in Mendelssohn�s writing. The penultimate movement is a sprightly minuet that is very reminiscent of the eighteenth century. The Aurora could have been more spirited and swifter in an interpretation that is somewhat wanting in vitality. A Haydnesque reading from the Bartholdy, so spirited and dance-like, avoiding the temptation to go too swiftly. The vivacious and fluent Pacifica are successful here as are the lively Talich who play superbly with their impressive rich tone. The Emerson have a big sound, purposeful and strong that contrasts with the Henschel�s playing that is rather tentative, needing a touch more spirit and freedom of expression to be ideal. Mendelssohn then proceeds to show off his skill in a double-fugue finale, where for the first time we hear the second violin, viola and cello as individuals. Fugal finales were characteristic of Haydn�s early string quartets showing the young Mendelssohn drawing inspiration from his predecessors. In the finale the Aurora seem unsettled and hurried in this hectic and crowded movement. The Bartholdy show considerable energy and urgency and their vital playing is of the highest possible order. Enthusiastic and strenuous playing from the Pacifica, however the Talich are less satisfactory here as their energetic playing is rushed and agitated without their usual element of control. Robust and noble playing from the Emerson and the interpretations from the Henschel offer a wonderful sense of ensemble and enjoyable music-making. In a highly competitive field, those choosing the version from the Aurora in the E flat major quartet (1823) will receive unaffected playing of considerable charm and grace rooted in the classical tradition. The accomplished Bartholdy on Arts Music are my first choice. A superb achievement and it is difficult to imagine the work being played better; totally convincing. The Pacifica are my third choice offering a searching and impassioned interpretation. Using considerable vibrato their remarkable playing is well shaped, thoughtful and smooth. Spirited and energetic, full-bodied and dramatic accounts from the Talich with one or two rough edges. The Emerson are as secure and expressive as one would expect. Richly burnished playing that tends to the romantic rather than the classical style. The splendid account from the Henschel is my second choice version. Their ardent and enthusiastic playing in the classical tradition has an appealing edge and bite. 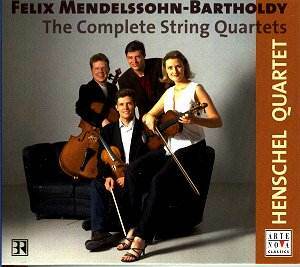 Mendelssohn composed his String Quartet (No. 2) in A minor, Op. 13 when he was eighteen in 1827, the year of Beethoven�s death. Although the work has a later opus number it was actually composed two years earlier than the String Quartet (No. 1) in E flat major, Op.12. It is not surprising that this early period work uses the string quartets of Haydn, Mozart and Beethoven as stylistic models and builds up from those. The score abounds in references to Beethoven. In particular the influence of Beethoven�s String Quartet in A minor, Op. 132, of 1825 is clear from the outset. They employ a common key and share several other similarities. There are also references in the adagio to the fugato of Beethoven�s String Quartet No. 11 in F minor, �Serioso�, Op. 95. The A minor String Quartet is immediately appealing and packed with melody and invention. Although Mendelssohn was only eighteen it is a mature work with his individual voice clearly discernible. By this time Mendelssohn had already composed two masterworks; the Overture to a Midsummer Night�s Dream and the Octet for strings. The A minor String Quartet displays the composer�s skill at the cyclical form, is highly contrasted in mood and provides a degree of passion and drama not normally associated with Mendelssohn. Compared to the earlier String Quartet in E flat major from 1823, the increase in independence, individuality and autonomy in handing the musical material is astonishing. Throughout the work Mendelssohn incorporates the technique of using a �song fragment� to generate key themes and its variants and expansions in the manner that Schubert employed in his chamber scores. Lyricism and high drama combine in a highly expressive opening movement that is led by the first violin. Lyrical melodies, rich harmonies and symmetrical phrases are a feature of this passionate and vigorous movement. The Aurora go swiftly here and are rather jerky in parts, although they settle down as the movement progresses. There is a typically powerful and dramatic reading from the Bartholdy that contains considerable tension and anxiety. We find exhilarating playing by the Pacifica in what is rather a bumpy ride and the excellent Talich offer intuition with a striking sensitivity in the passionate pages and with storminess in the vigorous parts. There is total technical control and exciting and spontaneous playing from the smooth and classy Emerson. The Henschel are alert and vital. Their ensemble playing is as if they were one. The second movement contains a complex structure and a dramatic climax. The marking adagio non lento means �slow not slow�, where the adagio refers to the intensely felt mood and non lento denotes the required deliberate pace. The Auroras take the movement lovingly with attention to the feeling of the piece rather than to the polish and the superb Bartholdys provide a mood of nervousness and intensity. There is aching emotion from the Pacifica, who come across as uncomfortable in the changes of pace. Ensemble playing out of the top-drawer in the gravely beautiful interpretation from the Talich, who resist the temptation to take the piece too slowly. The Emerson offer smooth and sensitive high quality playing, with a restrained passion that is perhaps too tentative at times. The Henschel marvellously convey the torment and aching sorrow that pervades this second movement. In the third movement intermezzo: allegretto con moto the pizzicato accompaniment punctuates a folk-like main theme whose dancing gaiety is contrasted with an agitated staccato mid-section. We have the elfin mood of the speedy trio and a song-like intermezzo that approaches absolute musical perfection. The Aurora are adept and agile throughout the movements changing moods. I was literally made to sit up by the breath-taking playing of the Bartholdy and anxious not to miss a second of their account. The Pacifica with revelatory clarity are vital and alert with beautifully judged shaping, phrasing and dynamics. There is stately and seamless playing from the Talich with judiciously chosen tempi. The Emerson are to be congratulated for adapting superbly to the fiendishly difficult shifting demands of the movement and the Henschel�s playing is sensitive and noble; expertly selected speeds in a top class interpretation. The finale returns to the emotional world of the opening movement. The influence of Beethoven is again apparent with its stormy recitative over tremolo accompaniment. The finale is one of the most complex movements the young composer ever wrote. The quartet concludes relatively modestly; gentle and calming. We have a rush to the finish line by the Aurora with their vibrant and tempestuous playing. The conclusion is especially lovingly played. I was completely bowled over by the Bartholdy account. It made me feel like I was nervously seeking shelter under a large tree in torrential rain with the fear of a imminent thunderstorm. Thrilling, characterful and incisive playing from the first class Pacifica. Between points 07:00 to 08:02 the violin of leader Simin Ganatra could almost be playing the highly romantic Violin Concerto of Brahms. The Talich are glowing and energetic and the muscular Emerson offer drama and excitement in this complex movement. There is breathtaking intensity from the Henschel, who are dark, stormy and fiercely propulsive, yet always under control. In the String Quartet in A minor, Op. 13 Mendelssohn is especially well served by the many superb recordings that are available. The Aurora offer a lovingly played account without any sense of routine. Grainy rather than stylistic performances that gives much pleasure. My number one choice is the terrific account from the Bartholdy, that is excitement personified, yet allows one to imagine the spirit of Haydn and Mozart. Hold onto your hats! Their rather close recording may be slightly off-putting at times for some ears. The performance from the Pacifica is thrilling with panache and a strong sense of purpose. My joint second choice in this quartet is the account from the Talich. Superbly and intuitively performed with enviable control and rhythmic precision. In their account the Emerson offer high emotional drama with generally fine playing. There is little in the way of a controlled classical style and the interpretation is often too tentative on occasions. The Henschel bring the work splendidly to life and are my joint second choice. They play as one with a sense of unbridled music making with an interpretation in the classical style and brimful of character. Although not part of a complete set and very different in style to the Bartholdy account I would not wish to be without the peerless period-instrument interpretation from Christophe Coin�s Quatuor Mosaïques on Audivis Astrée Naïve E 8622. The recording is coupled with the String Quartet in E flat major, Op.12. The String Quartet in E flat major, Op. 12 was commenced in Berlin and completed in London in 1829, during a trip to Britain. It is said that Mendelssohn may have secretly dedicated the score to the daughter of a Berlin astronomer, Betty Pistor, a singer who may have also been the inspiration for the earlier A minor String Quartet Op. 13. The score, as in the preceding A minor String Quartet shows the influence of Beethoven. The slow opening introduction is reminiscent of the beginning of Beethoven�s �Harp� String Quartet Op.74. Mendelssohn once again employs cyclical thematic techniques to join the score together with the finale periodically recalling material from the opening movement. The lyrical opening movement is a broad, passionate and beautiful section. The first subject is a spacious and emotional melody while the second subject has a calmer tone. The playing from the Aurora is passionate and vital. The Bartholdy expertly display the passion of the music and the first violin of Joshua Epstein is in especially fine form. An urgent performance, full of yearning and intensity by the Pacifica. The emotion is especially powerful in the section featuring their first violin, Simin Ganatra. The Talich give a rich interpretation that is heart-felt and expressive. Playing out of the top drawer from the Emerson, giving a real sense of an emotion journey and the impressive Henschel are alive to every bar. The second movement is a beautifully graceful, light and wonderfully simple canzonetta that became so popular with the public that it was sometimes played as an independent work. The folk-like main theme is contrasted with a faster paced, almost scurrying mid-section. Its charm lies in the pizzicato and staccato effects and the elfin humour of the closing measures. The Auroras are for the most part expressive and nimble however they are rather dull in the pizzicato and staccato of the closing section. Slow and measured playing from the Bartholdy that borders on the lethargic. The quicker paced mid-section is a vast improvement in fortunes, however the Bartholdy�s closing measures are not so convincing. Confident and direct playing with consummate ease from the excellent Pacifica and the Talich offer adroit playing with a feeling of real immediacy. The Emerson are a touch sluggish, although their playing is infused with joyousness and the Henschel give a first-rate version, peerless in the scurrying mid-section and closing measures. Music, p.454). The music begins quietly and as it progresses it grows in passion. There are richly melodious and closely drawn harmonies, with a prominent recitative-like solo for violin, before the movement ends. Noble expressive playing from the Aurora although I would have preferred a slightly lighter touch. The mood is rather heavy from the Bartholdy. There is a certain lack of vitality here and the movement seems to drag. The Pacifica play the movement beautifully and give a heartfelt reading of these singing melodies. Gravely beautiful playing with irresistibly rich string tones from the Talich. The Emerson are in a rather serious mood here with a restrained interpretation without the passion of some other accounts. Cultured playing from the Henschel with a poised line and a natural warmth. In the very spirited, impetuous and extremely brisk finale, Mendelssohn periodically recalls material from the first movement. In particular he reintroduces the beautiful theme of the opening movement which then, as in its first appearance, ebbs softly away. The Aurora augment the restless nature of the closing movement. Excellent work from the first violin of Sharon Grebanier in the subdued ending. Urgent and vibrant playing from the Bartholdy, although the players seem to lose their way in the final pages. Dashing and irresistible playing with deft changes of pace from the Pacifica and the account from the Talich is brisk, dramatic and wholly invigorating. Sparkling interplay from the Emerson in full-blooded accounts with considerable vibrato from Eugene Drucker the first violin. Perfectly judged tempi in the excellent interpretation by the Henschel. To select a top version of the String Quartet in E flat major, Op. 12 is a difficult task as all the accounts are worthy contenders. The Aurora Quartet give an authoritative classical style performance. Although the rather heavy string sound may be attributable to the closeness of the recording. I cannot recommend the Bartholdy as a leading choice in this score as they fail to fully engage the listener in a patchy interpretation. The Pacifica, offering imposing control, are my second choice. They have a light and warm string sound that undoubtedly suits the score, together with plenty of vibrato. Rich string tones in a close recording are the main features of the very fine account from the Talich. The Calliope booklet notes incorrectly describe the work as being in the key of B flat major. The Emerson offer total involvement in a wholly absorbing performance that contains significant vibrato. My premier choice is the irresistible and highly cultured version from the Henschel. The players in the classical style use only a modest vibrato and the recording is slightly dry. 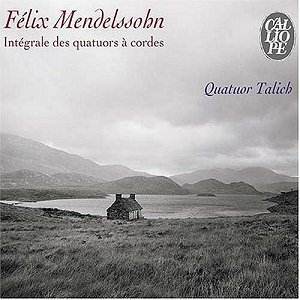 As an alternative, I would not wish to be without the peerless period-instrument account from Quatuor Mosaïques, on Audivis Astrée Naïve E 8622. The superb coupling is the String Quartet in A minor, Op. 13. Composed between 1837 and 1839, the three Op. 44 String Quartets mark the centre of Mendelssohn�s late compositional life, forging a true classical and romantic union of satisfying formal structures and expressive melody. Dedicated to �His Royal Highness, the Royal Prince of Sweden� the Op. 44 set is not always given the praise that it certainly deserves. The scores were designed to be played by Ferdinand David�s String Quartet and make heavy virtuoso demands on the players. It is full of rich melodies, entrancing harmonies and piquant dynamic contrasts. The String Quartet, Op. 44 No. 2 is in E minor, one of Mendelssohn�s favourite keys and was the first of the set of three to be composed. Mendelssohn married Cecile Jeanrenaud on the 28 March 1837 and sketched the work during his honeymoon in the Black Forest and went on to complete the score on 18 June 1837. Many musicologists consider this E minor score his finest essay for the string quartet. The temperamental opening movement allegro assai appassionato is lengthy at ten minutes. It is no longer preceded by a slow introduction as we have a melodic main subject over restive accompaniment. The elegiac rising theme for the first violin projects an agitated wistful quality that anticipates his Violin Concerto in the same key with its singing main theme. The movement contains a remarkably rich variety of material and texture, welded together with cunning craftsmanship to exhilarating effect. Breezy and spacious playing from the Aurora who gambol along confidently through this remarkable variety of material. A striding and brisk reading from the Bartholdy with an appropriate mood of agitation. The Pacifica are intimate and reflective in the slow sections and vibrant in the swifter tempos and the playing from the Talich is bold, intense and concentrated. In this movement the Emerson give one of the finest interpretations of a Mendelssohn movement. Their authoritative playing simply draws in the listener. A suitably passionate and brooding interpretation from the Henschel is worthy of genuine praise. The second movement is a rapidly paced scherzo of boundless invention that was extremely successful at its première in 1837. The movement recalls the scherzo from the Midsummer Night�s Dream and is another example of Mendelssohn�s inexhaustible invention in devising movements of this type. The music has always been understood as being �elf� music, owing to its scampering runs, dizzying melodies, surprising accentuation and considerable virtuosity. Expert playing from the Aurora with pace and intensity and the Bartholdy perform superbly; crisp and alive and technically assured. An exhilarating and confident interpretation from the Pacifica who are clearly enjoying themselves in this movement. The Talich offer an ardent and robust account with some rapid-fire playing and the Emerson interpretation is one of remarkable verve and considerable technical prowess. The excellent reading from the Henschel has that highly appropriate impish and scampering feel. The final movement presto agitato represents a rich model of a sonata rondo. The variety of compositional styles in the final movement brings into play Mendelssohn�s full powers of construction and expression. These range from the simple single upper voice accompanied by three lower ones, to complex concertante writing for all four instrumental voices. Motivically and rhythmically the finale shows its connections to the opening movement. The Aurora provide good expression and controlled pace with fine playing. There is a positive and forthright account by the Bartholdy that fully engages the listener. It is good to hear the ardently spacious reading from the Pacifica which feels just perfect. As in the opening movement the Talich supply a big, bold and intense account. In this movement the Emerson are stylish and fluent with a high degree of control of tempi and phrasing. There is impressive playing of the variety of compositional styles from the talented Henschel. Recommending a version of the String Quartet in E minor, Op. 44 No. 2 is a particularly difficult task. The Aurora is generally well played but one that contains a few jagged edges. A similarly well played and technically assured interpretation by the Bartholdy is slightly wanting in purpose and engagement. The Pacifica offer wonderful ensemble playing and their account, that contains considerable vibrato, is my joint second choice. There is plenty of character and vibrancy on offer from the Talich although other versions have more classical charm. My premier selection of the Emerson is not a performance from the Viennese classical world of Mendelssohn but an interpretation of sheer class and absolute command. In joint second position is the delightful and cultivated interpretation from the Henschel; full of subtle delights. The String Quartet in E flat major, Op. 44 No. 3 was worked on in the winter months after Mendelssohn�s return to Leipzig from honeymoon in 1837. It was completed in 1838. It is thought that Mendelssohn was not satisfied and he gave the work considerable revision. The E flat major Quartet is the richest in content of all the Opus 44 set and E flat major was one of Mendelssohn�s favourite keys. There is a great deal of contrapuntal interest throughout all four movements. One critic described the work as, "one of the wittiest, most brilliant compositions of its kind." Mendelssohn had enthusiastically studied the late quartets of Beethoven who was undoubtedly the inspiration behind this rich bodied and forward looking quartet. The elegant opening movement allegro vivace must be the longest in duration that Mendelssohn wrote for the medium. The record must surely be held by the Coull Quartet, who in their 1992 Hyperion recording took an incredible 13:48. Music writer Wilhelm Altmann praised the power, energy and passion of the opening theme. The theme is said to be Beethovenesque, using short-breathed motifs, instead of long lyrical melodies. The movement is probably the densest of all mature Mendelssohn. The wholly ardent performance from the Aurora untangles this dense writing to great effect. The Bartholdy offer a well played account that could have been more thrilling. If lacking in some energy the Pacifica are responsive to every bar and demonstrate the capacity to communicate. The Talich are rich, robust and bold with high intensity playing that reaches deep inside the music. The Emerson provide an unaffected interpretation with thrilling playing. One cannot fail to be impressed with the warm-hearted confidence shown by the Henschel. I could find few articles and references to this short scherzo movement. One writer described the movement as new and very typical, whilst another explained that the piece tended more to breaking apart rather than coming together. The scherzo movement brims with puckish mischief and with much rapid-fire staccato work. The Aurora are muscular and mischievous in the scherzo and the Bartholdy capture the scampering and rather agitated mood. The Pacifica offer an abundance of forward momentum but cannot match some of their rivals for power and attack. There is highly focused and extremely robust playing with relentless propulsion from the Talich and the Emerson perform with a real sense of purpose and co-ordination within the ensemble. The consummate handling of the driving forward momentum by the Henschel is worthy of special praise. The penultimate movement marked adagio non troppo has been acknowledged to prefigure composers such as Smetana, Brahms and Dvoř�k and has been described as the emotional heart of the work. With the chromatic harmonic relationship of the movement Wilhelm Altmann perceives a link to the slow movement of Beethoven�s �Harp� String Quartet in E flat major, Op. 74. The noteworthy interpretation from the Aurora is appropriately yearning with a superbly played part by the first violin Sharon Grebanier. In this movement the yearning quality of the Bartholdy account is impressive. The Pacifica offer sensitive playing that is natural, warm and expressive whilst the Talich performance is rapt rather than wistfully romantic, emerging tenderly as from another world. Particularly expressive and tactful playing from the Emerson with the first violin of Eugene Drucker in especially fine form. The Henschel play as a single voice allowing the music to live and speak to the listener. The closing movement opens with a furious impetus. A dance-theme and another full melody are contrasted with the melody of the coda entrusted to the second violin and viola, while the first violin indulges in some virtuoso display. Emphatic, firm and somewhat angry playing from the Aurora, like running away through thick undergrowth. Swift and satisfying playing from the Bartholdy that does not quite have the vitality of some rival versions. The Pacifica give a well performed, if rather restrained account and the Talich playing has the necessary vital ingredients to carry the musical argument forward. The Emerson seem to be enjoying their performance that is high on vitality and dynamism as are the Henschel who give a vivacious and eventful reading that soars and swoops like a bird of prey. In conclusion the String Quartet in E flat major, Op. 44 No. 3 is given an invigorating and robust performance by the Aurora with some rough-edged rather than stylish playing. The Bartholdy interpretation is well performed, however the lack of vitality gives a sense that the players are holding back. 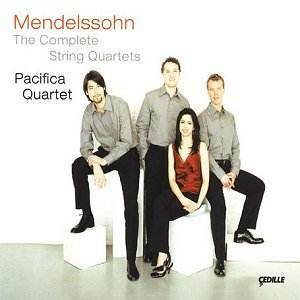 This is probably the least successful account of a Mendelssohn String Quartet by the Pacifica. For all their character and polish they just cannot match the necessary power and the energy of their main rivals. In third position, from the Talich we have a version with a marvellous blend of strength, vigour and conviction. The Emerson�s dramatic interpretation displays a genuine involvement with the music and is my second choice. My first choice is the performance from the Henschel who clearly have this music in their blood, playing with accomplishment, passion and considerable control. The String Quartet in D major, Op. 44, No. 1 was completed in the summer of 1838. Although the work was numbered the first of the Opus 44 set it was the last of the three to be finished. Said to be Mendelssohn�s favourite of the set, the work uses the bravura key of D major. On 30 July 1838 Mendelssohn wrote of the score to the violinist Ferdinand David, whose ensemble premièred the Quartet on 16 February 1839, "I have finished my third quartet in D major and I like it very much. I do hope it will be to your liking too. But I almost believe it will for it is more impassioned than the others and more rewarding for the musicians." An outstanding feature throughout this score is the brilliant running virtuosity required of the first violin. The opening movement marked molto allegro vivace is lengthy, with the Emerson taking the longest at 12:50. The movement exudes brilliance and exuberance and is light, lively and bracing in nature. The Aurora are excellent in this movement with a well paced and instinctive account that has an infectious exuberance. A striding and spacious reading from the Bartholdy reveals considerable detail. I can report another glitch in their sound, at point 04:14. The playing from the Pacifica comes across as rather bland and lacking in drama and energy. In contrast, the Talich in this movement are at their most appealing and infectious. Wonderfully natural and unforced playing here from the Emerson and the Henschel handle the opening movement with considerable freshness, albeit in a rather nervy manner. Historically-speaking, Mendelssohn moves a step backward and substitutes a menuetto for a scherzo-proper. The dainty and exquisitely melodious menuetto is rather antique-sounding and somewhat rococo in style. This is well-mannered, genteel music with considerable prominence given to the first violin throughout the majority of this movement. A lighter touch would have been preferred in this reading from the Aurora. The Bartholdy offer little in the way of elegance, as the players seem to lose their way in the slow pace. Lovely playing from the first violin of Joshua Epstein. The Pacifica seem sluggish in this movement, somewhat lacking in pace and passion. On the other hand their silvery-toned first violinist Simin Ganatra is on especially fine form. The Talich display absolute security of ensemble and the first violin of Jan Talich is worthy of special praise. The surging lines are beautifully wrought by the Emerson, with excellent playing from Eugene Drucker, the first violin. Conversely the Henschel are less successful in the menuetto with an interpretation that seems rather hurried. The third movement andante expressive ma con moto has a magical texture, delicately scored and charmingly harmonised. It is characterised by the evanescent pizzicato playing that appears in so many of Mendelssohn�s scherzos. But here the pace is slowed to create a gentle, almost retiring �song without words�. In the relaxed mood of the andante we have a welcome respite from the two previous movements, although the playing of the Aurora would have benefited from a little more delicacy. Tender playing here from the Bartholdy, although their interpretation is somewhat wanting in direction. The Pacifica offer compelling playing with superb string tone and the eloquent Talich play with spontaneity. Lithe yet deliberate and expressive playing from the Emerson and in this movement the thoughtful and imaginative Henschel respond well with a judiciously chosen pace. The spirited final movement marked presto con brio is structured with ingenious counterpoint. Something of a gigue found its way into the movement or perhaps instead of a gigue it is the same snappy and rhythmic buoyancy that fills the finale of Mendelssohn�s famous Violin Concerto. The movement concludes the work as if with a recapitulation of the first movement in spirit and sonorous brilliance. The Aurora are most spirited and determined here, giving a symphonic feel to the music. A well paced and attractively coloured reading from the Bartholdy. In this movement the Pacifica come to life with playing of considerable determination, with a real sense of engagement and the Talich display fine musicianship, that has considerable natural impetus. The Emerson offer truly fine playing, although I would have liked a touch more drive and the Henschel in this final movement are especially striding and airy. Of all the complete sets that I have heard, the String Quartet in D major, Op. 44, No. 1 is given the greatest variation in performance style. The interpretation from the muscular Aurora is somewhat on the heavy side. A lighter touch and increased sensitivity would have assisted, together with a need for greater variation in the amount of weight. Their close recording tends to favour the viola and cello. This is a decently performed version from the Bartholdy, although generally lacking in focus and unable to match the vitality of other accounts. The Pacifica are not up to their usual elevated standards, especially in the first two movements. The recording is close with some extraneous player noise. My joint second choice in this score is the strongly conceived performance from the Talich, that is consistently thoughtful and searching. The Emerson are my premier selection for their wonderfully polished and expressive playing. The blend of tone that the players achieve is nothing short of astonishing. In this quartet the Henschel performance invites admiration, especially for the final two movements. The vitality and refined playing of the Henschel awards them joint second position. "It would be difficult to cite any piece of music which so completely impresses the listener with a sensation of gloomy foreboding, of anguish of mind, and of the most poetic melancholy does this masterly and eloquent composition." These are the words of composer-conductor Julius Benedict, a long time friend of Mendelssohn. The F minor String Quartet is a work full of striking contrasts and is not typical of Mendelssohn�s output in general. The learned counterpoint of the capriccio movement in E minor and the classical balance of the three Opus 44 String Quartets are nowhere evident in this F minor Quartet. Drafted during the summer of 1847 and published in 1850 after his death, the score shows a great mastery of acoustic space in which Mendelssohn creates a harmonic bridge between Beethoven and high romanticism. Amazing for its emotional force, the score is deeply moving, tragic and full of dissonance, boldly overstepping the formal and expressive limits within which Mendelssohn had hitherto confined himself. Here Mendelssohn leaves behind the fantasy world of elves, fairies and visionary landscapes and joins the human race. His customary sense of emotional restraint disintegrates. With only months to live, Mendelssohn gave heartfelt expression to his shattering grief over the sudden death of his beloved sister and soul-mate Fanny, the eminent pianist and composer. She had suffered a fatal stroke during a rehearsal in Berlin in May 1847. For many weeks after her death her devastated brother was incapable of any kind of work. Having retreated to Switzerland for both physical and mental recuperation Mendelssohn wrote the F minor Quartet in the July. The poignant and turbulently charged score serves as a fitting musical lament to the death of his sister, for in it one hears the heart-wrenching pain of Mendelssohn�s personal grief. Agitation expressed through dissonance and unsteady rhythms is the key feature of the work outside the adagio movement. Naturally, it is an elegantly conceived composition. But it is also remarkable in that here Mendelssohn�s usual disposition of emotional reserve collapses completely. Mendelssohn�s facade of the surface coolness of a man born into the privileged upper classes, dissolves entirely, showing severe despair and rage. The opening movement, marked allegro vivace assai, immediately sets the sombre mood, and is cast in a serious manner worthy of Beethoven. The prevailing darkness is alleviated briefly for a lovely F major interlude, but this is a false respite, and one that in any event seems to simply stop rather than come to a fully developed conclusion. We are led back into the movement�s sorrowful conclusion by way of a brief presto section, in an acceleration that is as unexpected as it is sudden. The characterful interpretation of the opening movement from the Aurora is rugged and turbulent. The Bartholdy cannot provide the dynamism of rival versions. They seem to be holding back; although the final pages are suitably rousing. Ardent and vital playing in this movement by the Pacifica. The Talich are highly charged with most thrilling playing. However, with the Emerson I would have preferred a more forceful and weightier response. There is dynamic and passionate playing from the Henschel who blend together an abundance of enthusiasm and telling vitality. It would be misleading to call the second movement a scherzo as it contains so little in the way of cheer and pleasure. The movement is designated allegro assai and is punctuated with jarring syncopated rhythms. Again, there is something rather Beethovenian about this piece. While it is in triple metre, and begins with an upbeat, this is not the sunny, charming piece one might expect with these rhythms. The mood is almost sinister and macabre, an effect accentuated by the confounding of our expectations. The trio section isn�t able to alleviate the pervading air of despair. The Aurora in their interpretation are suitably bristling and unsettling. There is little in the way of spirit or that so-called �macabre� quality in this unwieldy account from the Bartholdy. The Pacifica are impressive in the nervy and harshly syncopated rhythms and the unsettling nature of the movement is well conveyed by the Talich but the playing is somewhat wanting in polish. The Emerson�s playing is agreeably poised and sprung and the Henschel offer a spirited and airy account but seem only moderately happy in these complex rhythmic changes. The intensely lyrical third movement adagio is a sort of elegy that has been fittingly subtitled as a �Requiem for Fanny�. Mendelssohn was renowned for his �songs without words� and this movement is cast nicely into that mould. A passage in the contrasting middle section sounds especially disconsolate and cheerless, while a sobbing climax leads to the gradual dying away of the movement. The Aurora provide a heart-felt and sensitive reading of the adagio with gravely beautiful playing and subtle control. Sadly, the Bartholdy fail to improve significantly on their hesitant opening pages. Mendelssohn�s feeling of abject despair is not as discernible here as in other versions. The Pacifica in this intense elegy play with an abundance of passion and fluency and the Talich suitably capture the prevailing mood of acute anguish. The listener is drawn in by majestic playing with tenderness and much soul searching from the Emerson and the Henschels superbly capture the lyrical languor and heart-breaking mood without ever becoming laboured. The final allegro molto revisits the turbulence of the first two movements; namely the agitated tremolos of the first movement and the jarring syncopations of the second. Although repeated sequences lead into the final moments, there is something of a precipitous feeling about its conclusion, which arrives by way of an impassioned and tempestuous coda. There is unmistakable aggression in this music, as if the composer was working through the anger phase of his complex and unbearable grief. The fluent Aurora give an interpretation that is restless, big-boned and striding. The underlying mood of restlessness and uncertainty is accurately conveyed in the account from the Bartholdy and the playing from the Pacifica is abundantly expressive and incisive. The Talich seem uncertain how to take this movement and there are moments of hesitancy. The Emerson are little improved, giving a rather low key performance with only slight expression. By contrast the razor-sharp Henschel are thrilling, taking the movement with a drive and brilliance that conveys the restlessness and fury of the music. To sum up, my second choice version of the String Quartet in F minor Op. posth. 80 is from the Aurora who give an excellent and powerful performance. They are able expertly to differentiate and convey the contrasting moods of the score. The account from the Bartholdy is deficient in the dynamism offered by the best versions. Frequently I experienced a heaviness and lack of spontaneity in their playing. In joint third position the Pacifica give a fine interpretation that seems balanced to give due recognition to the deeper voices of the viola and cello. The wonderful silvery-tone of Simin Ganatra, the first violin, is worthy of special praise. Characterful readings from the Talich who play with total dedication. Their choice of tempi is difficult to fault and they deserve joint third place. The Emerson offer a frustratingly sober affair, which I feel is their least successful work in the complete set. Their playing is fine and stylish although their interpretation comes across as deficient in vitality and propulsion. My first choice recommendation in this score is from the Henschel, primarily for their polished craftsmanship and winning communication. This music is truly in their blood and this interpretation demonstrates a real unanimity of vision between the players as well as scrupulous attention to the detail of the scoring. The Four Movements for String Quartet, Op.81 are miscellaneous, individual movements that Mendelssohn wrote between 1827 and 1847. The Four Movements are often played as a sort of supplementary work and the grouping was given the opus number 81 when published posthumously in 1850. I have seen the Four Movements played in different combinations but most usually in the published numbered sequence of Andante, Scherzo, Fugue and Capriccio. It is often fairly remarked upon just how little musical kinship there is across these four unrelated pieces; consequently they are not often performed as a set. The Andante movement in E major known as Tema con Variazioni was composed in 1847, it is thought during Mendelssohn�s final weeks. An undemanding and expressive theme is followed by inventive and delightful variations, the last of which erupts into a tumultuous presto. The excellent Scherzo movement in A minor was also written in 1847, around the same time as the Andante �Tema con Variazioni�. An attractive and lightly textured piece reminiscent of his scherzo from the incidental music to the Midsummer Night�s Dream. The piece falls into two alternating sections, of which the opening eventually dissolves into a simplified outline and two pizzicato chords. Mendelssohn challenges the idea of a formal conclusion as the theme exhibits a questioning and searching quality that never seems to find resolution. From 1827 and published posthumously, the Fugue movement in E flat major is the earliest work of the four movement set. The considerable sophistication of the piece impresses as a student exercise. Composed in 1843 and issued posthumously the Capriccio in E minor is in two distinct sections with an pensive opening andante followed by a contrasting strident and energetic allegro fugato to form a prelude and fugue. On Naxos the Aurora Quartet place the Four Movements for String Quartet across two of the discs in a miscellaneous fashion, rather than as an integrated score. Rather heavy playing from the Aurora in the Andante movement; it seems laboured in parts. The first violin of Sharon Grebanier lifts the mood of the performance profitably. In the Scherzo, again the playing feels heavy with little evidence of humour and spiritedness. The Aurora are serious and tender in the opening section of the Capriccio and felicitous in the closing half. The Fugue seems lacking in character although Aurora drastically improve the proceedings in the last third of the movement. On the Arts Music label the Bartholdy Quartet position the Fugue first on a separate disc to the other three movements which are coupled together in the probable order of composition, Capriccio, Andante and Scherzo. The Bartholdy are concentrated and alert in the opening Fugue and give a terrific performance. In the Capriccio the players appear rather nervous and serious, especially in the first section. The second half is rather routinely performed, lacking in spirit and vitality. The Andante is heavy going with little sense of direction. All is forgiven in the closing Scherzo as the stylish Bartholdy perform with creditable spirit and the music springs to life spontaneously. The Pacifica Quartet on Cedille play the Four Movements for String Quartet coupled together, with the customary order of the Fugue and Capriccio reversed. In the Andante the Pacifica provide a disciplined performance that communicates an underlying tension. A spirited, light-hearted and lithe interpretation in the Scherzo. This is excellent playing that embraces the carefree nature of the score. In the first section of the Capriccio the players are most mellow and heart-felt, followed by an adept and exuberant reading of the second section. The Pacifica in the Fugue perform with considerable expression and create a mood of near-desolation. The Talich Quartet on Calliope also perform the Four Movements for String Quartet combined together with the Fugue as the final movement. They are buoyant and fresh in the Andante and in the Scherzo offer a real sense of enjoyment in a vigorously played account. The Talich in the Capriccio combine subtlety with a robust and intense second section and in the Fugue their playing evinces real concentration in this rather unsettling movement. The Emerson Quartet on Deutsche Grammophon arrange the Four Movements for String Quartet in an assorted order over two of the discs, rather than as a unified work. The assured Emerson open with the Fugue and offer beautiful playing that seems to go around and around with little sense of direction. In the Capriccio the playing has a suitably ruminative intensity that later changes to a feisty and gambolling character. The Andante is superlative and stimulating without any hint of the routine. Eugene Drucker, the first violin, is in top form. In the Scherzo they give a swift and vital performance that shows a real neatness of ensemble although I would have favoured more sprightliness. The Henschel on Arte Nova play the Four Movements consecutively, in the conventional published order. They perform the Andante with expressiveness and perception, providing considerable vivacity and humour in the Scherzo. The players are searching and tender in the bleak Fugue, where Mendelssohn displays deft workmanship and frugal resourcefulness. In the Capriccio they offer a convincing and vigorous approach which is highly impressive. Selecting just one version of the Four Movements is a difficult task. The playing of the Emerson is of such a high quality that it almost gets my vote as top preference but has to settle for being a worthy runner-up. The superbly performed interpretation from the Henschel gets my confident vote for its complete identification with Mendelssohn�s spirit and sensibility. 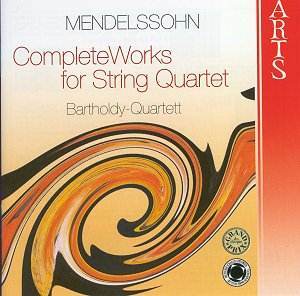 When selecting my personal recommendation of a set of Mendelssohn�s Complete String Quartets I am struck by the many excellent choices that we now have available; the competition in the catalogues is exceptionally fierce. Every complete version that I have heard is well performed and worth hearing, and clearly a great deal is dependant on the personal taste of the listener. 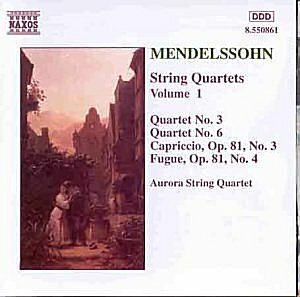 However, the more that I understand about the dynamics of Mendelssohn�s life the more I prefer my string quartet ensembles to take a more classical approach, that uses minimal vibrato, rather than offering playing of sumptuous romanticism. The Aurora on super-budget Naxos offer much personality and energy in their accounts - available only as three single volumes. Their performance style is one that I could easily imagine set in the Viennese classical period, although at times the playing would have benefited from additional panache and finesse. At the time these recordings were made, all the players, lead by Sharon Grebanier, had been long time members of the San Francisco Symphony Orchestra. Where rough edges are present one wonders about the amount of rehearsal time that was available to these exceptionally busy players. None of these accounts from the Aurora is my first choice in this intensely competitive field, nevertheless the players� understanding of the music is acute and there is much to enjoy. Recorded at Fisher Hall in Santa Rosa, California the crisp and clear Naxos sound quality is very acceptable with the players closely captured. The Naxos liner notes are not the most interesting read but they are highly informative. Recently arrived on my desk for review is the re-released complete set of the String Quartets from the Bartholdy Quartet on the German based Arts Music label. We are informed that these accounts were the first ever complete set to be recorded back in 1973. These successful and acclaimed recordings have received the prestigious Deutscher Schallplattenpreis and the Grand Prix du disque awards. I recall these recordings being previously available on the Acanta label 43-075. The first two String Quartets on the set; the String Quartets in E flat major (1823) and A minor, Op.13 are exceptionally well performed with tremendous character, commendable spirit and sheer excitement. Even though there are versions more in tune with the Viennese classical world that Mendelssohn so cherished, I felt compelled to select both as my first choice recordings. Unfortunately the Bartholdy were unable to maintain their exceptionally high standard throughout their subsequent interpretations. There was a general sense of heaviness elsewhere, and when compared to the leading versions, a deficiency of engagement, vitality and spirit. The Bartholdy�s use of vibrato is not excessive, which assists the interpretation. Although these recordings are now thirty-two years old, the bright and clear sound quality stands up rather well. The players are quite closely caught and this did not present too many problems. The DDD logo is pressed onto each disc, which is surely not accurate, as these 1973 recordings are too old to be digital. These will almost certainly be analogue recordings that have been digitally remastered. There is a sense of corner-cutting with the presentation of this set. I was aware of two irritating glitches in the sound quality and several infuriating mistakes in the annotation; most notably the incorrect naming and timings of the movements of the String Quartet in A minor, Op.13, on CD 1. Furthermore, the recording venue is not specified in the annotation. The Arts Music set contains a detailed essay on the Mendelssohn String Quartets by Ulrich Schreiber, which was not the easiest of reads. I understand from the Arts Music label that the Bartholdy Quartet is no longer in existence. Nonetheless, it is good to have these accounts back in the catalogues, and they serve as an excellent legacy to their art. The complete set of the String Quartets from the American based Pacifica Quartet on Cedille exudes style and sophistication with playing that has an abundance of character and warm expression. Especially remarkable throughout is the sweetness of tone and the silvery-timbre of Simin Ganatra, the first violin. The rather lush playing and the conspicuous amount of vibrato from the Pacifica is not I feel an advantage in this repertoire. Consequently some may find the approach too far from the Viennese classical world that Mendelssohn occupied in spirit and too close to the highly romantic world, of say, Brahms, a generation later. After a strong initial attraction to these accounts I became aware of a sense of heaviness which becomes wearing and cloying, a feeling that intensifies after repeated plays. Recorded at the Pick-Staiger Concert Hall, Northwestern University in Evanston, Illinois, the sound quality is a touch too warm for my taste, although the players are well caught. This Cedille set offers pretty good liner notes that are informative and easy to read. These accounts, currently available by USA import at a special price, will provide much pleasure but can only be my third choice selection. Wholehearted commitment and overflowing with energy are just two of the many attributes that can be awarded to the complete set from the Talich String Quartet on Calliope. The award winning Talich under the leadership of Jan Talich were founded at the Prague Conservatory in 1964 and have built a solid reputation for playing of the highest quality. The set is currently available from Calliope at mid-price. With total assurance the individual approach of the Talich is astonishing. At times the strength and boldness of their playing seems to be at the expense of Mendelssohnian charm and refinement. These are not glamorous or glitzy accounts and may attract less attention than some superior marketed rivals. Recorded at the Studio Arco Diva Domovina in Prague the sound quality is cool and clear although I did experienced some fierceness in the forte passages. The Calliope annotation is interesting and reasonably informative. Even though these performances are not amongst my first three recommendations this set would sit comfortably in any serious chamber music collection. The renowned power and panache of the Emerson String Quartet from the USA is superbly displayed and their classy playing is out of the top drawer. Lead by Eugene Drucker, they have built up a large following over the years, who will surely relish these polished interpretations - all well thought through with scrupulous attention to detail. There are times when that special Mendelssohnian character could have been more present, as their playing becomes a touch too luxurious and romantic. Recorded at the American Academy of Arts and Letters, in New York, the sound quality is crisp and clear and most realistic. The liner notes written by R. Larry Todd were a fascinating read. This excellent four disc set from the Emerson on Deutsche Grammophon is currently available at mid-price and will never be far from my CD player. It is my second place recommendation among the complete sets. This set also includes an astonishing version of Mendelssohn�s Octet for strings, which is reviewed below and the fourth disc also serves as a CD-ROM, featuring a video documentary: �Recording the Octet�. The German based Henschel String Quartet under the leadership of Christoph Henschel is notable in that three of the players are siblings. Their versions of the Mendelssohn String Quartets have previously only been available in three separate volumes on Arte Nova, without the advantage of the early String Quartet in E flat major (1823). Quartet violist Monika Henschel-Schwind has recently sent me a pre-release copy of the complete set, which is due to be released at the time of writing. That box now thankfully includes the early String Quartet in E flat major (1823). The Henschel�s aristocratic playing is sparkling and exhilarating. The music is consistently expertly performed and this Arte Nova set is my first choice among all the available sets in this terrifically competitive market. These interpretations are surely the closest to Mendelssohn�s favoured Viennese classical period. The Henschel�s accounts would undoubtedly have won the advocacy of the ultra-classically orientated Mendelssohn as they consistently discover tempi that completely convey both the letter and the spirit of the music; the most sparing use of vibrato feels just perfect. The Henschel clearly have a special affinity for these scores and their interpretations are masterly illustrations of humane, old world music-making. Recorded in Munich at the Bavaria Studio and the Bayerischer Rundfunk, the very acceptable sound quality is clear although perhaps just a touch too cool. The high standard of annotation from Arte Nova proved extremely useful. More good news is that these performances are available from Arte Nova at super-budget price. However, the reality is that this magnificent set of the complete Mendelssohn String Quartets would have been my first choice selection even at full price. The set of the complete Mendelssohn String Quartets from the Emerson on Deutsche Grammophon includes an account of Mendelssohn�s masterwork, the Octet for strings in E flat major, Op.20. As a bonus, the fourth disc also serves as a CD-ROM, entitled �Recording the Octet� which is an entertaining and informative eleven minute video documentary of how the four Emerson members recorded the Octet for strings. The performers, with the encouragement of producer Da-Hong Seeto and the assistance of recording studio technology, decided to record the Octet themselves, rather than engage four additional players. The Emerson used eight different instruments that included some very famous originals and some modern copies, without stating which instrument was played at which time. Make no mistake this project was not just made for amusement or for reasons of expediency ... the Emerson take their art very seriously. Both the concept of four players taking all eight parts and the finished result have divided critical opinion and caused some controversy. My opinion is that the Emerson have provided a very special interpretation that made me sit up and take notice. It is certainly worthy of comment here. 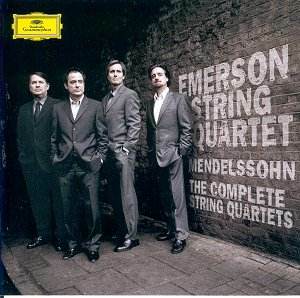 As this review is intended for the purpose of Mendelssohn�s Complete String Quartets, I will not attempt to compare the Emerson version of the Octet for strings in great detail with other available recordings. Mendelssohn composed this masterwork, in 1825, soon after his family had moved into a large and imposing house in the Leipzigerstrasse on the outskirts of Berlin. It is a work of pure genius and it is truly amazing that Mendelssohn was only sixteen at the time. His achievement was all the more remarkable as he composed the work virtually out of the blue with no precedents or models to follow. Compositions for Octet were extremely rare, especially those for strings only. Louis Spohr had recently composed a work for Double string quartet, which was not the same as an eight-part octet. Beethoven in 1792 had written an Octet for winds in E flat major, Op. 103 and the Schubert Octet in F major D. 803 was scored for winds as well as strings. Possibly Mendelssohn had heard the Schubert F major Octet, which was first performed in 1824. It is also worth pointing out that Mendelssohn�s teacher Friedrich Zelter could not have assisted him a great deal, as he was not capable of writing anything near as good himself. Music writer William Altmann aptly provided a description of the character of Mendelssohn�s Octet for strings, "The sea of sound that rages through the Octet is very powerful, achieving indeed quite an orchestral tone at times, though there is no lack of delicate passages." Mendelssohn left instructions that, "This Octet must be played by all the instruments in symphonic orchestra style ... pianos and fortes must be strictly observed and more strongly emphasised than [one] is used to in pieces of this character." The playing from the Emerson in the warm and spacious opening movement is hugely impressive. Right from the opening bars I could feel the red-hot intensity of this reading and I particularly enjoyed the masterly change of pace that they achieved so effortlessly. Their playing in the gently lyrical second movement andante is so full of passion that I found it so overwhelming it sent a wave of shivers down my spine. Make no mistake, this is no coiffeured performance, but a highly sensitive and beguiling musical experience. The third movement is the first example of what was to become Mendelssohn�s trademark elfin-fairy scherzos. The thrilling and high-spirited character of the movement is played with a razor-sharp alertness, superb control and rhythmic precision. The final movement presto, with its masterly fugal writing is a dazzling tour-de-force, given a marvellous reading that projects the drama and intensity to most brilliant effect. The sound quality is cool and clear, although there was plenty of sonic activity going on down the left channel of my headphones, it did not detract too much from the pleasure of the performance. In my collection I have several top quality accounts of Mendelssohn�s magnificent Octet. I hold in high regard those versions from the Leipzig String Quartet on MDG Gold 307-1057-2; The Chamber Music Society of Lincoln Centre on Delos DE 3266; the period-instrument version from Hausmusik on Virgin Veritas 5-61809-2 and the critically acclaimed interpretation of the 1978 recording from the ASMF Chamber Ensemble, on Philips 420-400-2. Listening to any recording of this wonderful work has never previously engendered that special feeling of awe and total involvement as conveyed here by the Emerson, who penetrate deeply into the heart of the score. They are now my leading choice in the Octet. Simply superb!